"dot" it and be brave! We started the school year talking about "being brave" in 1st grade. We watched Winnie the Pooh and Christopher Robin talk about this as well. After completing a week of school, I wanted to revisit the "be brave" rule in my classroom. 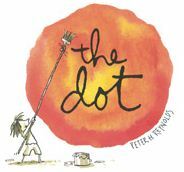 Today we read Peter H. Reynolds book The Dot. Upon completing the book, we discussed how Vashti wasn't being brave with her art to start. When she took a risk to be brave she found out that she could be good at art. I had my students thinking about which subjects in 1st grade might be hard for them. They had to pick one subject they thought they weren't good at. Then they used this PDF to create their own "dot." After each student's "dot" was completed, they used the colAR Mix App to make their 2D dot come to life in 3D. The app allows you to snap a screen shot of your 3D "dot." All the students took a screenshot of their "dots." We then used Animoto to create a short video of our "dots" to be brave with this year. My school has a total of 42 iPads to date. This does not include my 5 that are part of a pilot project for my district. Initially the 42 iPads were going to be set up as a class set. However, after initial trial and error, we have allotted 5 iPads for each grade level team to share. The grade level team each has their own Apple ID that they will use to manage their 5 iPads. 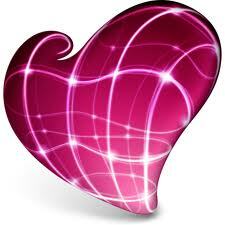 This allows them to install any free apps they would like and organize the apps to their own desire. The trick was coming up with a simple storage/charging method. 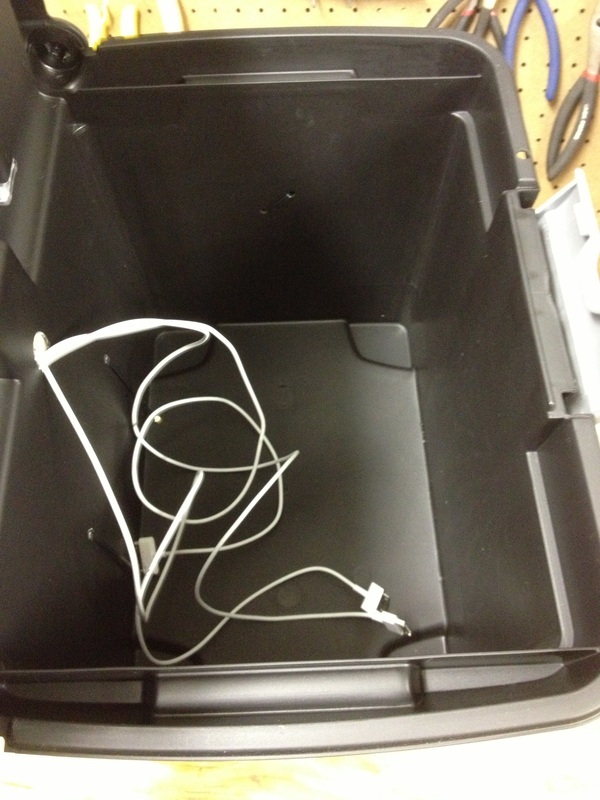 Below is what I came up with as a simple, cost effective method for storage and transportation of the iPads. 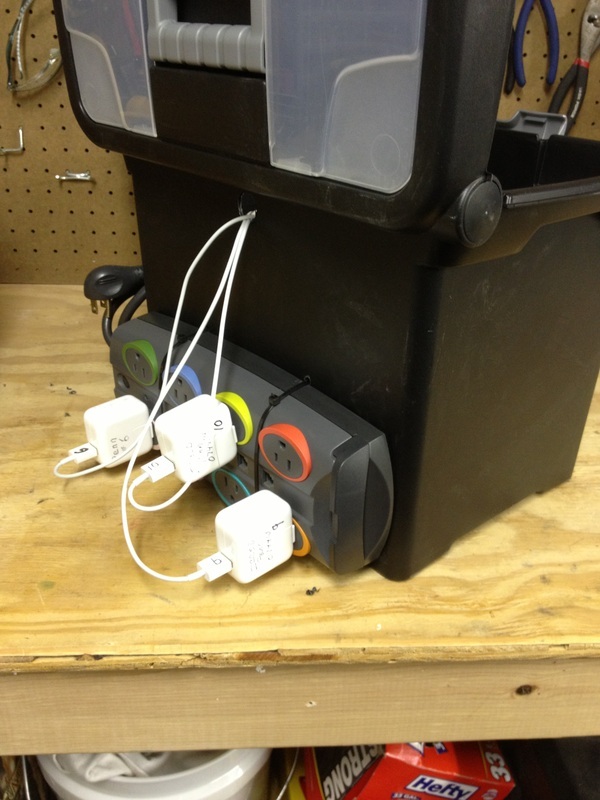 2) Power strip--drilled holes on back of tub and zip tied the power strip to the back. 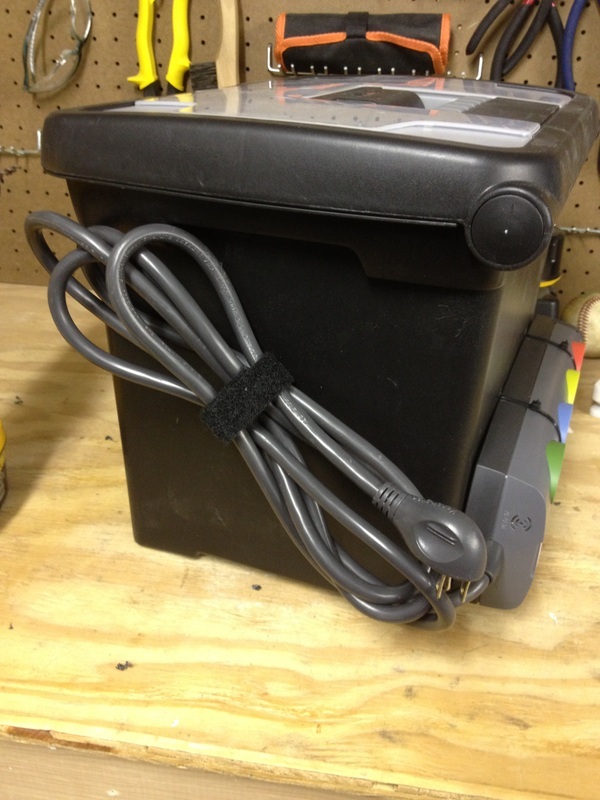 3) Velcro--drilled holes on side and zip tied some Velcro to hold the cord when not charging. 4) Spade bit used to drill hole through back for iPad power cords to run inside of box. 5) iPads can sit vertical or horizontal and charge. We already had the power strips but the tubs were $10 at Wal-Mart. Zip ties were $3 for a 100. You could get a power strip for $10 or less. In my classroom, I am always on the hunt for ways to make our learning more efficient and effective. I never seem to have enough time to give the one-on-one attention that my students so desperately need. Over the last few days, I have been playing around with creating a blended learning opportunity for my 1st graders. You can see the brief outline below of how we have been doing this. There is also a short video modeling the same process. I used the app Explain Everything. We use the Everyday Math curriculum. I took screen shots from my SMARTBoard lessons that I had created. These screen shots served as a starting point for modeling the lesson for the day. I kept the videos to about 6-8 minutes. Explain Everything allows you to upload directly to You Tube. Once uploaded, I took my You Tube URL and pasted it into SafeShare.TV This generates a link that will only play my video without all the extra clutter around. I used Kidblog to serve as a central location for my videos. This was partly because we use Kidblog in my classroom anyways, so my students are very familiar with it. I create a new post for each day's lesson. Within the post I add a link to my SafeShare linked You Tube video. I also add a link to my quiz for students to take after watching the video. I wanted a way to quickly check for understanding. I used Google Forms to create a quick quiz to check for understanding. However, with first graders, I needed pictures. Since Google Forms doesn't allow you to add images to your form, I did a work around. I created a Google Site to hold my quizzes. I changed the layout to 2 columns. In one column I embedded the Google Form and on the other column I inserted the pictures via a table with corresponding numbers to the question on the form. After students had watched the video and taken the quiz, I used Flubaroo to auto correct the quiz results. Below is a video that will visually show you all these steps in a simplified manner. Today we continued our work with finding shapes in our everyday lives. To give the students a chance to find shapes in more than just our school, we used Google's Street View Collection and the Educreations app to complete a real world shape hunt. Since we share 5 iPads in my class, I wanted a quick way for students to access the street view collection. I opened Safari and located the NASA street view collection and added a bookmark. With the iPads being on the same iCloud account the book mark synced to all the devices. 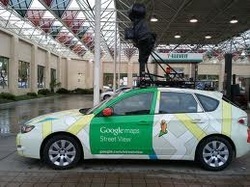 This allowed students to quickly access Safari and the bookmark to find the street view collection. Once in the NASA Street View, students chose a picture to capture and insert into Educreations. Check out the video below explaining this process. We had some technical issues part way through this process so many students didn't get the chance to complete their shape hunt. To revise this lesson, my students would have recorded while tracing and explain the shapes that they were tracing. Below are some student samples of their completed product. Students used the Educreations app to take pictures of shapes in our classroom or hallway. After inserting the picture into the app, students traced the shape they found and recorded their explanation of the shape. They had a great time hunting for shapes. 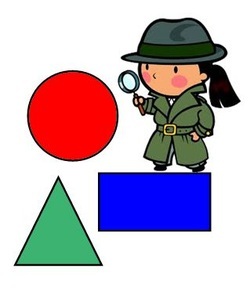 I had a few students comment that they never knew how many shapes could be found in our classroom. I briefly modeled how to take a picture within the Educreations app. After the short explanation, I demonstrated how to trace the shape and record their explanation. Students then got put into groups of 3-4 students to complete their shape hunt. Below are a couple examples of the final product. To celebrate the birthday of Dr. Seuss, we utilized the Dr. Seuss Camera app. The app lets you choose an existing photo or take a photo. You choose the frame that you would like. In addition, you can add extra borders and stickers to make your picture exactly how you want. I heard about this app via Apps Gone Free. It was still free as of 3/3/13. It was a fun, easy way to celebrate Dr. Seuss' birthday. You can see our final product below. In attempt to make our learning more authentic and incorporate technology, we practiced adding and subtracting using QR Codes. Prior to this lesson, I created 12 questions. Each question included a picture of an item from the grocery store and its cost. In addition, I put a picture of a coupon or a picture of sales tax next to the good to be purchased. 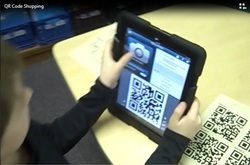 Students would scan the QR code to display the question. Once the question was displayed they had to determine if they must add or subtract (coupons--subtract; sales tax--add). Once they determined adding or subtracting they then had to work together to figure out what the final cost of the good would be if they were to pay. Check out the video below for a quick look at this learning experience. The kids loved it and did great. If you want to try it yourself, you can get the materials from Teachers Pay Teachers for free. How do we use iPads? Check out the short video below to see some of the ways that we have been using the iPad in our classroom. We are excited to have 5 iPads to use in our classroom. The first graders have been doing great with picking up the skills needed to interact with the tablets. This is a free app that works hand and hand with Evernote. You do not need to have an Evernote account in order to use Skitch. 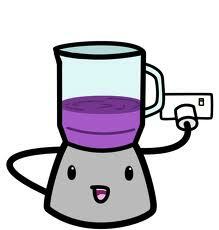 It works just fine on its own. There is a short video below that outlines some uses of Skitch. **The video is on an iPhone but has the same features on the iPad. Skitch is a very simple annotation tool for your phone. Mark up maps, pictures and even web pages. My first graders used Skitch for Martin Luther King Jr. Day at our school. Check out Our Big Words. Students took a picture of themselves and then added their "big words" to their pictures. We then used PhotoSnack to create a photo slide show and shared it on Kidblog. As I continue to implement iPads into my classroom, I am always trying to find good, quality stories for my students to interact with while using the iPads. I thought I would share some of the resources that we have been using when incorporating e-books on the iPads. These ebooks are not only my favorite but my students' favorites as well. Each page has fun and interactive components. Students can have it read to them, read to themself or even record their reading. If they choose to have it read to them, each word is highlighted as it is read aloud. The best part is they are free. Below are a list of the titles. Find out about their free school accounts. Multiple books to choose from. Students can access them at home on a computer as well as on an iPad and iPhone. Did I mention it is free? When students decide on a book, they can chose read the book on their own or have it read to them. The best part of having the book read to you is that each word is highlighted as it is read. This is an app that is created and managed by Scholastic. The short video below explains it best. I continue to accumulate bonus points from my class book orders. I have been using these points to purchase new e-books for my students to read. One of my favorite features of Storia is the dictionary. Once downloaded, students can press a word during the story and have the meaning looked up instantly.